The Arctic Methane Alert poster was created by Sam Carana for display at the AGU Fall Meeting 2011. Above poster is a slightly different version. 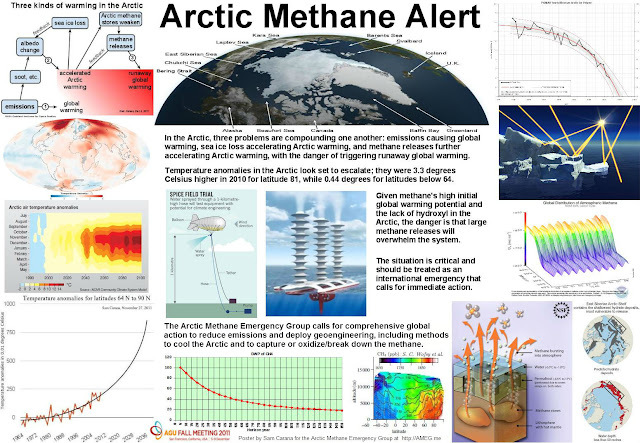 The poster was displayed at several conferences, and also appeared in the presentation that Paul Beckwith gave on December 2, 2012 (see video below). 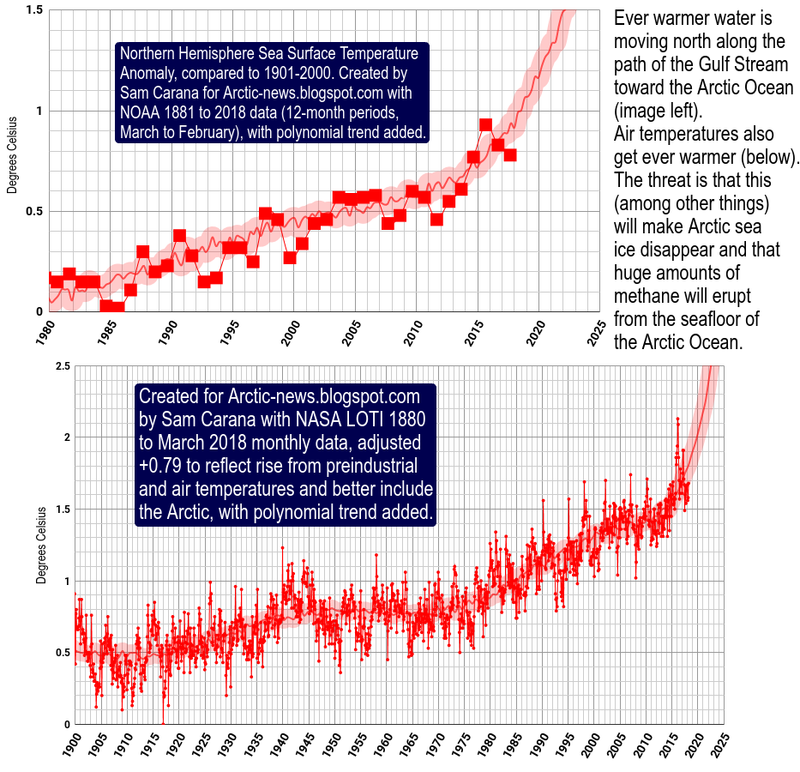 Somehow Arctic needs to be shielded benignly and not only present emissions reduced but made to go effectively below zero by somehow getting past CO2 emissions from industrialization and land use changes withdrawn physically from the atmosphere quickly and at huge scalable ways beneficial to us. That entails Emergency action on a scale set to Maximum.. It means peace in the world that holds steadily.. It means tapping writ 'Act of God' to change things.. Speed of change needs to be very fast indeed and luck is a factor that is needed too. We need to be honest as to where we are now and frame another way forward which allows progress. I love this Blog! , But respectfully , as a lay-person with no real ability to comprehend , nor apply the technical parts of your information .For the sake of all of us since it will take each person to make any thing get better at all .. 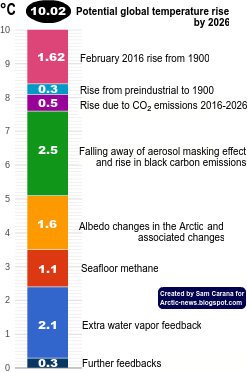 I hope you would better inform the masses in a realistic way , Please Define : How much average creation of carbon and methane or other negative impact emissions ,we each produce , or average per day or month. Then describe in clear terms , a real solution in day to day practical terms , that we all can reduce and even eliminate these negative impact emissions . I know there is a deep need for a plan, that all people can directly take part in now with out waiting for the Government( s ) of all nations or other Corporations to take the initiative . ( Since we know that's not happening, either fast enough or ever) Since governments and Corporations main agenda is commerce above all else . Regardless and indifferent , to the clear facts that means we are all going to die soon, from their flagrant miss-management of our eminent destiny ) Personally I think if we turn back the social lifestyle to the late 1700's we could live much longer and more sanely . The Amish really do know some things we all should learn from . Simple and less is more . Local communities can start implementing the Climate Plan now, if they haven't already made a start. One of the advantages of the ClimatePlan is that local implementation can start without having to wait for global agreements to be reached.